Snowboarder Chris Corning of Silverthorne takes to one of the slopestyle jumps at the Dew Tour's slopestyle course at Breckenridge Ski Resort on Tuesday. Corning will compete in Sunday's men's snowboard slopestyle finals at the Dew Tour at Breckenridge Ski Resort. Chris Corning of Silverthorne looks at his score during the men's slopestyle qualifying round at Phoenix Snow Park at the 2018 Winter Olympics in Pyeongchang, South Korea on Feb. 10. Corning will compete in Sunday's men's snowboard slopestyle finals at the Dew Tour at Breckenridge Ski Resort. Chris Corning of Silverthorne jumps during the men's slopestyle qualifying round at Phoenix Snow Park at the 2018 Winter Olympics in Pyeongchang, South Korea on Feb. 10. Corning will compete in Sunday's men's snowboard slopestyle finals at the Dew Tour at Breckenridge Ski Resort. For years now, the token word in competition snowboarding has been “progression.” If there is one rider globally pushing to see how far the line of progression can go, it may just be Chris Corning of Silverthorne. Need evidence? How about the two snowboards he broke in a freak way — right through his rear heel cup. 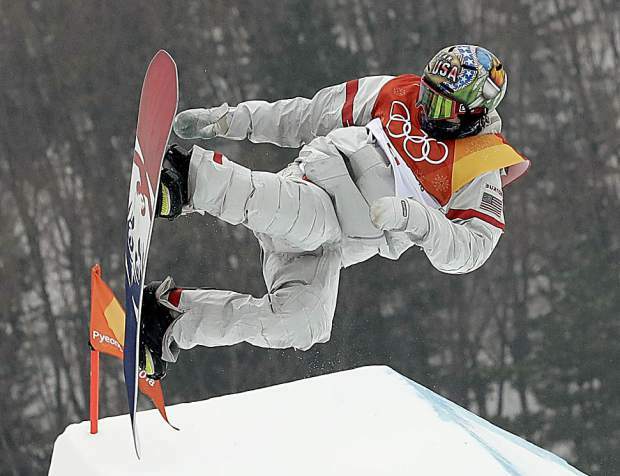 Snowboarders typically break their boards in half or on the tail. The culprit? Corning’s massive, soaring, physics-defying backside quad-cork 1800. It’s a trick that requires him to invert on his vertical axis four times while in the air while also rotating horizontally for five, full 360-degree spins. Corning became the first American to land an 1800 in competition at the Cardrona, New Zealand, season-opening big air World Cup event in September. It may go without saying, but he won the event on the strength of the trick. But do tricks like Corning’s 1800 require too much strength? That’s a question many in freeskiing and snowboarding are asking, particularly during a week at Dew Tour at Breckenridge Ski Resort when modified halfpipe and slopestyle courses are rewarding stylish rail runs and inventive lines over massive tricks. Corning is aware of this dynamic. But it’s not going to stop the reigning International Ski & Snowboard Federation World Cup overall Crystal Globe champion from doing what he may do better than anyone else. So which way will Corning go moving forward? Much like other riders, he’s not exactly sure. Wherever his career leads, though, it’ll be anchored by the football player-like strength he’s worked to develop over the offseason. Corning estimated, physically, he is twice as strong right now compared to how he felt during last winter’s stress-filled Olympic process. 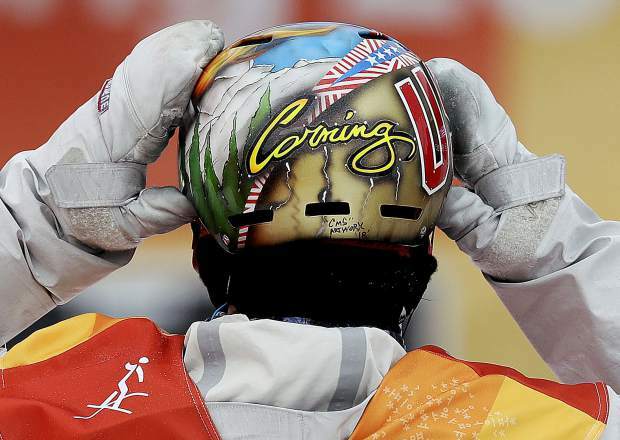 Yes, Corning attemped his 1800 on the big stage at the Pyeongchang Olympic big air event, slamming the rear of his air-brushed Team USA helmet to his snow in the process. But he was so much weaker last February due to a lingering hip and lower-back injury that forced him to stick to the couch for weeks on end ahead of the Olympics. That injury is better now, but it’s certainly not healed. Corning said he’s never met a snowboarder with an injury like this one. He said doctors still don’t know exactly what’s wrong with it. When doctors assessed it last year, he said they didn’t see anything. An MRI of his spine may be necessary moving forward to figure out what he says might be a disc issue. Corning also is still dealing with a lingering foot injury to his rear leg after the goofy-foot rider broke his left foot a couple of years back. He says it still affects his ability to balance on his left foot — the same one that broke through those two boards on those torque-filled 1800 attempts. Though he feels better physically, in a perfect world, Corning wouldn’t have to compete through the pain. That’s where his summer full of next-level strength work comes into play. After the Olympics and World Cup scene concluded in the spring, the former child-star football player Corning began training five days a week at Landow Performance in Centennial. It’s a sports performance center founded by Loren Landow, who is now the head for strength and conditioning for the NFL’s Denver Broncos. Through the summer, Corning drove down from his home in Silverthorne five days a week to work with Landow sports performance coach Nate Henry. Corning was the first snowboarder Henry has worked with. The strength work with Henry included trap-bar workouts, ball work for his core, squats and a good amount of upper body exercises. They were all to improve his ability to guard against injury. Corning’s approach is certainly not the norm for the majority of freeskiers and snowboarders. That said, he realizes with the magnitude of the gigantic tricks he’s routinely dialing in, his style of snowboarding may require going above and beyond in the gym. “It’s mostly just one-on-one,” Corning said of his work with Henry. “I tell him what I’m thinking and what I need and he works around it. Then he watches what he sees and what I do and makes workouts that he thinks will help. And, so far, they are helping. Corning is certainly hopeful working with Henry will get him back into tip-top shape. Corning found Henry via his roomate T.J. Tropsa, who Henry helped to heal from a broken back during his high school football career down on the Front Range. The most important thing Corning says Henry has instilled in him is the power of proper rest. Previously, Corning said he’d work out as hard as he could as fast as he could to get it done. Now, he’s taking the proper breaks to help speed his recovery. Even if he’s not 100 percent, Corning is at the point now where if jumps are big enough, he’s figured out what it takes to land the 1800. In fact, at the U.S. Ski & Snowboard team’s pre-season training at Saas-Fee, Switzerland, earlier this season, it was Corning who made other athletes’ jaws drop with his casual execution of the 1800 on just his third run of the day. At Sunday’s Dew Tour slopestyle competition (noon to 3 p.m.), Corning will not be attempting the 1800. 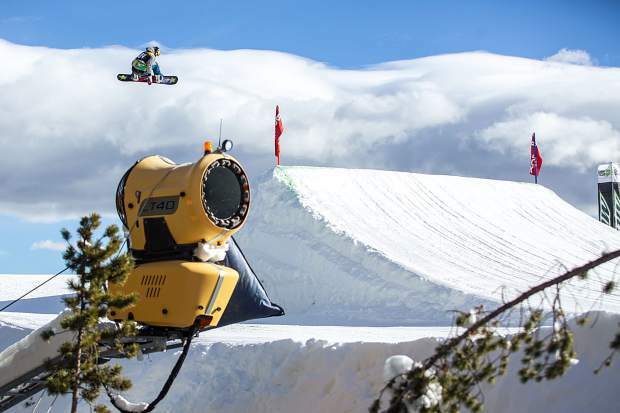 The jumps aren’t big enough, as the move is meant for the one money-shot big air competition. After taking second and, in turn, qualifying for the Olympics at last year’s Dew Tour slopestyle competition, Corning’s focus this year is on easing back into slopestyle riding and having fun. For a 19-year-old, Corning is very self aware. He says he realizes sometimes previously in his career he’s been too serious. And he realizes he may give off that impression at times. But now, after the Olympics, he’s making sure to only snowboard if he’s having fun. That includes riding the greens and blues at Keystone Resort with his mother Laura and father Brook. That also includes building jumps in the backcountry powder at Vail Pass with his buddy Windham “Lawndart” Miller. It’s also precisely the message he shared with the young Woodward at Copper riders he spoke to at a camp this summer.